3.51. 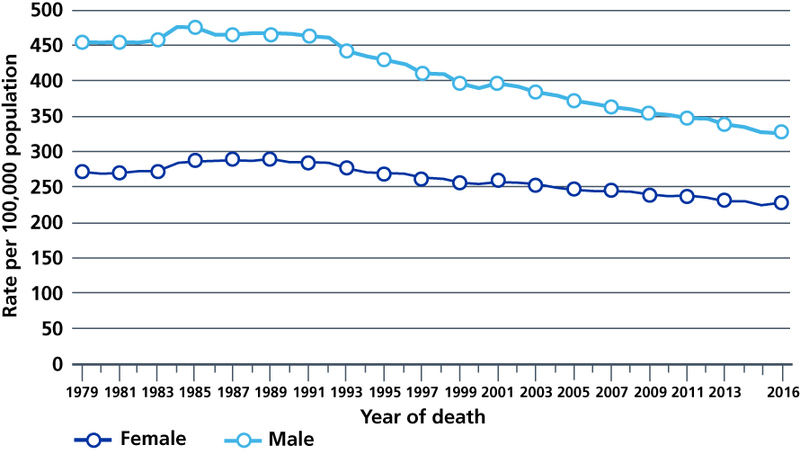 Cancer survival is the highest it’s ever been and thousands more people now survive cancer every year. For patients diagnosed in 2015, one year survival was 72% over 11 percentage points higher than in 2000. 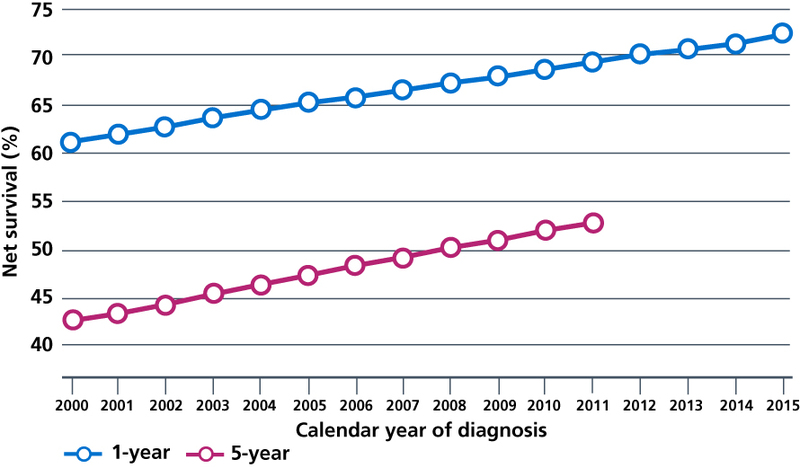 Despite this progress, one of the biggest actions the NHS can take to improve cancer survival is to diagnose cancer earlier. Patients diagnosed early, at stages 1 and 2, have the best chance of curative treatment and long-term survival. 3.52. This Long Term Plan sets a new ambition that, by 2028, the proportion of cancers diagnosed at stages 1 and 2 will rise from around half now to three-quarters of cancer patients. Achieving this will mean that, from 2028, 55,000 more people each year will survive their cancer for at least five years after diagnosis. We will build on work to raise greater awareness of symptoms of cancer, lower the threshold for referral by GPs, accelerate access to diagnosis and treatment and maximise the number of cancers that we identify through screening. This includes the use of personalised and risk stratified screening and beginning to test the family members of cancer patients where they are at increased risk of cancer. 3.53. We will modernise the Bowel Cancer Screening Programme to detect more cancers, earlier. The Faecal Immunochemical Test for haemoglobin will be easier to use for patients. In trials it has been shown to improve take up rates by 7%, including among groups with low participation rates such as men, people from ethnic minority backgrounds and people in more deprived areas. We will lower the starting age for screening from 60 currently to 50. 3.54. We will implement HPV primary screening for cervical cancer across England by 2020. This method of testing is more sensitive and more reliable than liquid-based cytology so will detect more women at risk of cervical cancer and facilitate their treatment to prevent cancer developing. 3.55. NHS England has asked Sir Mike Richards to lead a review of the current cancer screening programmes and diagnostic capacity. This will make initial recommendations by Easter 2019 and be finalised in the summer 2019, to further improve the delivery of the screening programmes, increase uptake and learn the lessons from the recent issues around breast and cervical screening, and modernise and expand diagnostic capacity. We will take forward the findings of the review as part of this Plan. 3.56. Over the next two years, we will extend the lung health checks that have already produced strong results in Liverpool and Manchester. Patients will have a breath test and a discussion to assess their individual lung cancer risk. Any patient assessed as being at high risk of lung cancer will have an immediate low-dose CT scan. During the Manchester trial, 65% of lung cancers were diagnosed at stage 1 and 13% at stage 4, compared to 18% at stage 1 and 48% at stage 4 before the trial. From 2019, we will deploy more mobile lung CT scanners – taking the support to people in supermarket car parks – starting in parts of the country with the lowest lung cancer survival rates. This will identify more cancers quickly, pick up a range of other health conditions, including chronic obstructive pulmonary disease (COPD), and help reduce inequalities in cancer outcomes. 3.57. For fast growing cancers, shortening intervals between referral to treatment saves lives. For every person with suspected cancer, shortening the anxious wait between suspicion and exclusion or confirmation of cancer will deliver a far better experience of care. More cancers are being diagnosed following a GP referral or from screening, with reductions in diagnosis through emergency presentation . We want to ensure that all GPs are using the latest evidence- based guidance from NICE to identify children, young people and adults at risk of cancer . Primary care networks will be required to help improve early diagnosis of patients in their own neighbourhoods by 2023/24. 3.58. We will begin introducing a new faster diagnosis standard from 2020 to ensure most patients receive a definitive diagnosis or ruling out of cancer within 28 days of referral from a GP or from screening. For people diagnosed with cancer, it will mean they can begin their treatment earlier. For those who aren’t, this will put their minds at rest more quickly at a very stressful time. To support the delivery of the new standard, we will align our Cancer Alliances with STP and ICS footprints and NHS England and NHS Improvement regions. They will implement a new timed diagnostic pathway for specific cancers, building on the timed pathways already being introduced in lung, colorectal and prostate cancer. Data collection for all patients will start in 2019, with full monitoring against the standard beginning in April 2020, and performance ramping up as additional diagnostic capacity comes online. 3.59. The new faster diagnosis standard will be underpinned by a radical overhaul of the way diagnostic services are delivered for patients with suspected cancer. From 2019, we will start the roll-out of new Rapid Diagnostic Centres (RDCs) across the country to upgrade and bring together the latest diagnostic equipment and expertise, building on ten models piloted with Cancer Research UK, which have focused on diagnosing cancers where patients often present with non-specific symptoms and may go to their GP many times before being sent for tests, such as blood and stomach cancers. In time, RDCs will play a role in the diagnosis of all patients with suspected cancer, including self-referral for people with red-flag symptoms. For patients with cancer, this will mean they can get quicker access to an accurate diagnosis and begin their treatment. The majority of patients who do not have cancer, but may have other conditions, will be referred on quickly to get the right support. 3.60. The NHS will use its capital settlement to be negotiated in the 2019 Spending Review in part to invest in new equipment, including CT and MRI scanners, which can deliver faster and safer tests. Broader reforms of the way that diagnostic services are organised – including pathology and imaging networks – will also mean test results can be turned around quickly and staff time and skills will be used most effectively, so that patients can have multiple successive tests in one visit. As set out in Chapter Six, this will improve quality of care (including patient experience) and efficiency, while reducing variation in clinical outcomes. 3.61. We will speed up the path from innovation to business-as-usual, spreading proven new techniques and technologies and reducing variation. As part of the NHS’ contribution to the Tessa Jowell Brain Cancer Mission, 5-ALA – which enables more accurate surgery on brain tumours – will be available in every neurosurgical centre in England. New investment will ensure the next generation of treatments are implemented rapidly across the NHS. 3.62. Safer and more precise treatments including advanced radiotherapy techniques and immunotherapies will continue to support improvements in survival rates. We will complete the £130 million upgrade of radiotherapy machines across England and commission the NHS new state-of-the-art Proton Beam facilities in London and Reforms to the specialised commissioning payments for radiotherapy hypofractionation will be introduced to support further equipment upgrades. Faster, smarter and effective radiotherapy, supported by greater networking of specialised expertise, will mean more patients are offered curative treatment, with fewer side effects and shorter treatment times. Starting with ovarian cancer, we will ensure greater access to specialist expertise and knowledge in the treatment of cancers where there are fewer or more risky treatment options. 3.63. We will extend the use of molecular diagnostics and, over the next ten years, the NHS will routinely offer genomic testing to all people with cancer for whom it would be of clinical benefit, and expand participation in research. The NHS will begin from 2020/21 to offer more extensive genomic testing to patients who are newly diagnosed with cancers so that by 2023 over 100,000 people a year can access these tests. 3.64. By 2021, where appropriate every person diagnosed with cancer will have access to personalised care, including needs assessment, a care plan and health and wellbeing information and support. This will be delivered in line with the NHS Comprehensive Model for Personalised Care. This will empower people to manage their care and the impact of their cancer, and maximise the potential of digital and community-based support. Over the next three years every patient with cancer will get a full assessment of their needs, an individual care plan and information and support for their wider health and wellbeing. All patients, including those with secondary cancers, will have access to the right expertise and support, including a Clinical Nurse Specialist or other support worker. 3.65. After treatment, patients will move to a follow-up pathway that suits their needs, and ensures they can get rapid access to clinical support where they are worried that their cancer may have recurred. This stratified follow-up approach will be established in all trusts for breast cancer in 2019, for prostate and colorectal cancers in 2020 and for other cancers where clinically appropriate by 2023. From 2019, we will begin to introduce an innovative quality of life metric – the first on this scale in the world – to track and respond to the long-term impact of cancer. From 2019 we will start to roll out new Rapid Diagnostic Centres across the country. In 2020 a new faster diagnosis standard for cancer will begin to be introduced so that patients receive a definitive diagnosis or ruling out of cancer within 28 days. By 2020 HPV primary screening for cervical cancer will be in place across England. By 2021, where appropriate every person diagnosed with cancer will have access to personalised care, including needs assessment, a care plan and health and wellbeing information and support. By 2022 the lung health check model will be extended. By 2023, stratified, follow-up pathways for people who are worried their cancer may have recurred. These will be in place for all clinically appropriate cancers. 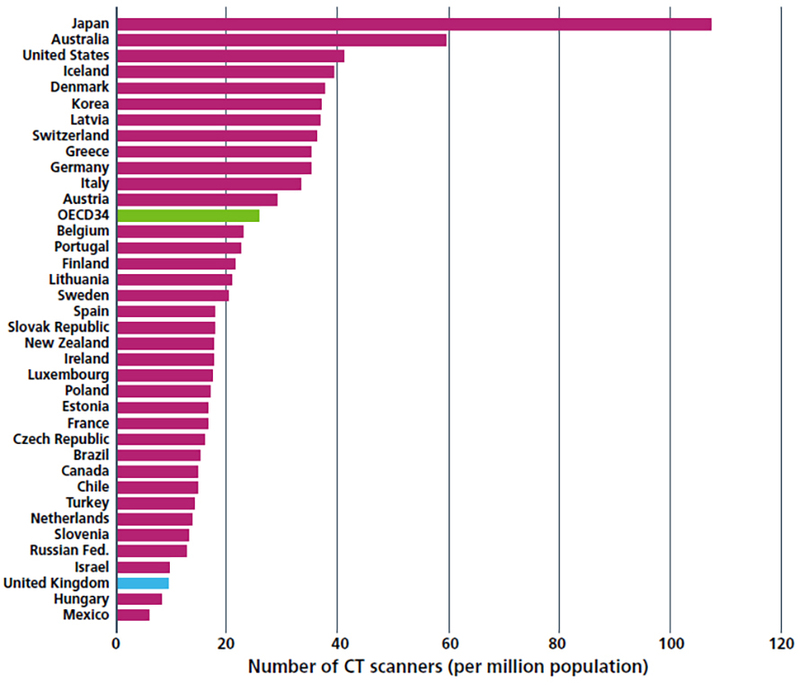 By 2028, the NHS will diagnose 75% of cancers at stage 1 or 2.